As listeners of the podcast will almost certainly know, Stockton, California is planning a basic income trial for 2019. Jim spoke with Stockton Mayor Michael Tubbs and project leader Lori Ospina about new details regarding how the program will be structured, how recipients will be selected, and the challenges and responses so far to the Stockton Economic Empowerment Demonstration. For more information, you can go to StocktonDemonstration.org. Owen: As listeners of this show will undoubtedly know one of the most exciting developments in the basic income space is the coming basic income trial in Stockton, California next year. Jim: There has been some recent announcements that tell us a little bit more about how that trial is going to work. Giving us more of a sense of how things are actually going to be developing in the months ahead. 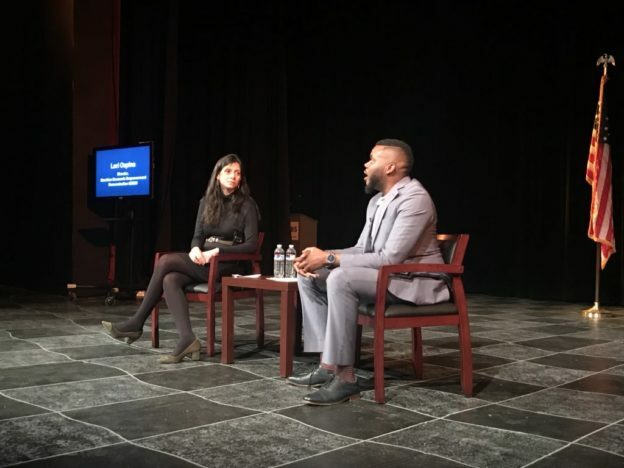 Owen: To hear about some of the most recent announcements and the motivation behind the trial and everything else we know to date, Jim got to sit down with Michael Tubbs, the mayor of Stockton, California and Lori Ospina, the director of the Stockton Economic Empowerment Demonstration. Jim: Thank you both for joining on the Basic Income Podcast. Lori: Thank you for having us. Mayor Tubbs: Glad to be here. Jim: Let’s start with the motivation for SEED. Mayor Tubbs, what first gave you the idea to pursue a basic income pilot in Stockton? Mayor Tubbs: Well, I think a lot of it comes from two things. Number one, about a quarter of our population lives in poverty. I’ll argue another 25% to 30% is one paycheck away. I believe that poverty and economic insecurity is at the core. A lot of the other issues we face in the city from housing affordability to homelessness to crime, et cetera, educational attainment, et cetera, et cetera. Also, just from lived experience, coming from a single parent household with a mom who worked incredibly hard and still struggled has always given me a passion for using the tools in government to create the conditions where the bottom doesn’t have to fall underneath people while being part of our community. With those motivations in mind, I had a group of policy researchers research some of the most radical intervention they could think from poverty. Last year, they came back with basic income. I had been familiar with the term from reading Dr. King, what he called for in Where Do We Go From Here: Chaos or Community?. The next week, we were able to meet the Economic Security Project who said they were looking for a city to pilot basic income, and that’s where SEED was born. Jim: For most basic income pilot programs around the world, the sole purpose of the pilot is quantitative research: running a controlled experiment with randomized groups where some people receive a basic income, others don’t, and then looking for differences between those groups after some amount of time. But you’re aiming to do more than just the quantitative research in Stockton. You not only have researchers involved in the pilot but also artists and cultural creatives. What’s the motivation behind taking that approach? Mayor Tubbs: Lori, feel free to jump in. Briefly, I’ll say that we understand that data alone doesn’t move people. For an idea and a concept like this, to really have it take hold, folks need stories, folks need images, and folks need art to really help raise consciousness, and also show that this is not a policy for “them” but for “all of us”. I think art has a way of doing that more so than a research study. Lori: I would just add to that. I think that was a lot of what the vision that our funder, the Economic Security Project, had for it. There’s been a lot of research studies that have been done, and I think we collectively realized that there’s no absence of white papers on the topic. There’s no absence of results and data points. Yet, still somehow when we go out into the country and you try to talk about this idea, you still get what I call the knee-jerk reaction, the doubt, the skepticism that this can’t work or that it wouldn’t be used in an effective way. I just really feel that by humanizing the experience of individuals, it allows people to see it with new eyes. Folks that maybe haven’t engaged in the conversation or hadn’t looked at some of the evidence today, we can pull them into another channel. Jim: Yes, that makes a lot of sense. It aligns with what we’ve heard from a lot of other basic income advocates around the idea of what actually they’re seeing move people out there. It’s so exciting to hear that we’ll have more on that space through this spotlight. Now, you hosted an event recently where you announced some key details of the plan for the Stockton pilot. Can you share what was in that announcement? We were really excited to update people on what the plans were now that we have them in place. We had intentionally held it off really designing the selection process until we had our research evaluation partners on because we wanted to make sure that whatever way we chose, we could measure it in a meaningful way once we selected the recipient. Having our research team on board, we landed on a process which essentially is that, in order to select recipients, we will do a two steps process. The first step is, we’ll filter out all of the neighborhoods in the City of Stockton, where the area median income is at or below $46,000, which is the area median income for the City of Stockton. Then, basically taking those neighborhoods that meet that income requirement, we will randomly choose addresses, and we’ll randomly send mailers out to potential recipients across those neighborhoods. We’ll start with about 1,000 knowing that some people may not respond, some people may toss away the letter, and some people might just not be compelled to participate. Then from the people who we actually get a response from, we’ll randomly select about 100 recipients. Anyone who is not selected to be a recipient will then be invited to participate in the research components. While I know it’s not as good as a deal as getting $500 a month, we’ll still invite them to fill out surveys, participate in qualitative interviews, and when they do that, they’ll be compensated for their time. That was pretty much the gist. The goal was really to help clarify and get the word out that people didn’t need to sign up or didn’t need to do a process at this point. We had mixed reviews on how well the message was received, though. A lot of people are really in need of help. Even though we made the announcement, we did hear from a lot of people still asking the question, “How do I sign up?” It’s been an interesting learning process and a good opportunity to talk with residents about the process and teach them and educate them on why we settled with the approach we did. Jim: I’m curious to hear more about how the community has responded to this. This is something different than is happening anywhere else in the US. I imagine people in Stockton have thoughts on that. What generally seems to be people’s take that this is happening there? Mayor Tubbs: I think a lot of people are excited for Stockton to be so cutting edge in the amount of attention it has received. I think the questions we get are, to Lori’s point earlier, “How do we qualify?” I think the people who are most critical are folks who think they won’t be able to get the money, which is interesting. Lori: Yes. I would agree with the Mayor. Generally, someone asked me point blank the other day because I was talking about all the messages I received. They asked me point blank like, “Are most of them good? Are most of them bad? What do you see?” I really took stock. When I did so, I really feel and looked through the messages and whatnot. I really feel that the overwhelming response is positive. A lot of people who want to be considered. A lot of people who hope they will have a chance. Even those who we ultimately say, “It’s going to be random. I can’t tell you if your address is going to be selected or not”. We do hear, “That makes a lot of sense. That seems really fair. I still hope I’m randomly selected, but I get it and that feels like a good approach and even if I’m not randomly selected I hope it reaches someone who will really benefit or really needs it”. A lot of really good will around it I would say. Jim: That’s great to hear. Now, one thing that people often talk about with basic income is its simplicity and that being a positive thing. Often with the premise that if you’re just giving people cash, it will be very easy to manage the program. We’ve heard from other folks who are working on a cash transfer pilots that it often ends up being considerably more complicated than you might expect to get all the execution right on that. Lori, can you share some of your experiences on getting everything planned and up and running with SEED? Lori: I know the Mayor is eager to see the project rolled out. I’m always trying to do it as quickly as possible. What I always say is that it’s really easy to hand out money. I could have done that on my very first day on the job. I think the thing that makes it complicated is doing it in a thoughtful, meaningful way that can ultimately be measured and tell us something insightful. A lot of our delays or not even delays, but just a lot of what’s taking time is making sure that we can measure it. Making sure that our research and evaluation team is on board and in place and that they have the time necessary to develop the tools for analysis and for surveys and interviews and whatnot. The actual disbursement itself, there’s some complexities to it, but I think once we get started it does actually become fairly simple. The one major stumbling block that I think is probably what some of the other folks have referred to or mentioned is around benefits interaction. Public benefits. The guaranteed income is intended to be a charitable gift for the purposes of learning and charitable purposes. But when it bumps up against the public benefits system, the interaction becomes a little bit more complicated. The way it’s currently structured, even if we want to give the guaranteed income as a charitable gift, the public benefits administrators won’t view it that way, because it is recurring and because it’s predictable. They believe that the responsibility is on the recipients to report it as anticipated income. In which case it might lead to reductions in the public benefits that they’re currently receiving. That’s been really challenging. I don’t know how much I want to get into the weeds here, Jim. In our purposes, given the fact that we are a smaller sample size, I think we have a little bit more liberty to work around that. What we’ve ultimately landed on is that we realize that that limitation exists, and we are not really going to be able to control for it at this time. Rather than trying to do so, we will make sure that potential recipients, before they commit to receiving the benefit, will be given all of the information they need in the advance to make a fully informed decision. If at the end of the day, $500 a month is not in their family’s or in their household’s best interests, they will be given the chance to pass it up. If it is, then they’ll be given the chance to accept it. Jim: It sounds like there’s some potentially challenging decisions and processes to be figured out in advance, but once you have those in place, you expect things to be much simpler. Lori: Yes. I think there’s just so many ways, I say this all the time, every decision, there’s so many ways you can go with it. Cash touches every aspect of every person’s life. Trying to streamline it is almost impossible. Every decision we had to make, whether it was around the disbursement mechanism or the evaluation questions or the interaction with public benefits, they took time, and it was important to be thoughtful about them for sure because each one opens up a different net of possibilities. We’re closing in on a lot of them and eager to put it on autopilot. Jim: Now, since the program was announced almost a year ago, it’s been very apparent that there’s a huge amount of interest in SEED out there. Mayor Tubbs, I know you’ve done a bunch of media appearances and I’m assuming have had conversations with many different individuals and organizations who are interested in the pilot. Has the reactions from people surprised you in any ways? Are there things that have stood out about those conversations? Mayor Tubbs: I’ve been surprised with just how many people are really struggling in this economy. People who you think have fairly good jobs or fairly stable income will still talk about not be able to afford health insurance or rent or the kid’s college et cetera. That’s been incredibly eye opening. Then number two, how receptive, at least in the conversation, policymakers, elected officials, and folks are. In June, I spoke at the lunch plenary on the US Conference of Mayors to 400 mayors across the nation just about basic income. Many came up after really excited trying to figure out how could their city be a part. Folks who are running for offices or planning to run for offices themselves or their staff, they’ll contact us, myself and Lori, to get more information. I didn’t realize so many people would be so interested in what we’re doing in Stockton. Jim: Taking a step back, and imagining where things will be in, I guess, a bit over a year, when the pilot wraps up. What would success look like for you with this pilot? Mayor Tubbs: I think for me, success is just having the pilot. The idea is to demonstrate, to show, to do, while being agnostic as to what exactly is shown. Since we’ve been knee-deep in the research and the community engagement, I think success overall looks like being able to answer the question with a study around what happens when people get $500 a month, no strings attached. Number one, what do people do with the money? Number two, does it make their lives better? It’s having some answer to those questions will be success to me. Jim: Alright. Well, those were all the questions that we had. Anything else that either of you would like to add? Mayor Tubbs: For folks who want more information, they can go to stocktondemonstration.org or @StocktonDemo on Twitter and Instagram. Owen: That was Jim Pugh, Michael Tubbs, and Lori Ospina on the Basic Income Podcast. I think the main thing I took from that is just how much excitement and momentum there is around this trial and how it’s not just people in and around Stockton but politicians and leaders who are looking to this to be something where they can point to, to talk about basic income and bring it into the conversation. Jim: Yes. The fact that Mayor Tubbs mentioned how much interest there was from other mayors but also people who are considering or are already running for office, I’m wondering if in the months ahead we’re going to start to see a lot more things popping up with basic income, either pilots or this being a major part of people’s policy platforms in the year ahead. Owen: Yes, and it provides a reference point where now you don’t have to say basic income, this idea that outside of Alaska, we don’t have a lot of current data on in the US. Now we can say that thing going on in Stockton, let’s do that in the rest of the country. Jim: Definitely, having more– it’ll be more normalized effectively. It’ll just be something that is happening out there and seeing how that will affect people’s perception, how that might potentially break down some of these barriers to adoption that we’ve encountered to date. I also thought it was– this is something that we’ve talked about before, but just the challenges of getting set up with a pilot here. It’s something where you have to make sure you get your ducks in a row. It’s so important because you’re talking about something that could transform people’s lives for the better, but if you do it wrong, that could backfire in many, many ways. I’ve heard at times people express skepticism, maybe, at the fact that some of these things were taking so long. But I really think this is an area where you need to make sure you’re getting things right. Owen: Yes, especially because it is so new. I think maybe we even gloss over that factor that basic income is a new policy and just people aren’t quite sure how to react to it at first, so to normalize it a bit but also to make it so that it actually works I think is crucial. Jim: Yes. I’m very eager to also see and hear the stories that come out of Stockton since, we’ve talked about this before, but the culture change aspect of this is so fundamental and getting to really get these personal experiences of what difference basic income is making in someone’s life. I think that could be a game changer. Owen: Yes. There’s going to be a turn of media on this one way or another. Just to have actual interview subjects who can talk about their life before and after. Yes, that’s really going to stick with people. That’ll do it for this episode of the Basic Income Podcast. Thank you to our producer, Erick Davidson. Please subscribe and rate us and review us on the podcast service of your choice. And tell your friends — we are always looking to bring more people into the movement. Talk to you next week. This entry was posted in and tagged basic income, basic income pilot, podcast, seed demonstration, stockton, ubi podcast on October 16, 2018 by owenpoindexter@gmail.com.